Each year, T3 is blessed in as much as we get to see and go hands-on with the best technology in the world. Sure, we have to filter through a fair few duds along the way, as not every piece of new technology released is a hit worthy of our readers' attentions. However, more often than not the gadgets we get to play with are game-changing. Not every year is equal, though. With noticeable periods where new technology remains very firmly on tracks laid down in previous years, with iteration (as good as that can be, admittedly) the name of the game. Other years, though (and 2018 is a good example of this) see rafts of innovative new products released that forge new tracks, creating new product categories altogether or radically shaking up and changing existing ones. To celebrate the innovation we've seen so far in 2018, here we present a list of some of the most notable tech and gadgets that have turned our heads here at T3.com this year. Not all of these gadgets are going to change the world, but many are going to lay down foundations that will be built on for years to come, changing the world for the better through innovation. The Oppo Find X is not only a beautiful, highly capable mobile phone, but it also delivers an innovation in the mobile smartphone industry, which is a very rare thing indeed. That's because this bezel-free beauty comes with an integrated pop-up camera; something that allows the entire front of the phone to be dedicated to screen real estate, leading to a truly astonishing 93.8 per cent screen-to-body ratio. Is this Oppo Find X the best smartphone on the market today? Far from it, but it is one of the most innovative and has delivered a welcome jolt to an industry content often with iteration, rather than innovation. 8K TVs are coming. We know because T3 has been following their progress for years now, and excitedly 2018 turned into the year where the technology seemed to explode among manufacturers, with multiple makers delivering 8K panels. The most impressive, though – and one that highlights the innovative technology that will be a major driver in getting people to adopt 8K TVs without any 8K content right now – is the Samsung Q900R QLED. The Samsung Q900R QLED is an 8K panel with 4,000 nit peak brightness. However, it also specialises in "8K AI Upscaling", which allows non-8K content to be upscaled close to 8K, meaning that users can make the most of existing non-8K streams and content. When released there was just so much hotness contained in the Sony a7S full frame mirrorless camera that it was hard to know where to look in terms of innovation chops. If the world's first full-frame sensor capable of full pixel readout on 4K video wasn't enough, or the fact that the sensor was packed inside a mirrorless, palm-sized device, then the insane, phenomenal sensitivity of up to ISO 409600 that made low-light photography a dream sold the Sony a7S as a game-changer. Professional video functions such as XAVC S Full HD recording at 50Mbps, time code and optional XLR audio inputs were icing on the innovative cake. These earbuds look rather unremarkable until you discover that: first, they are completely wireless and second, they can automatically and instantly translate other languages to your native language on the fly. Now, the Mars earbuds aren't the first device to have a crack at this concept, with the Google Pixel Buds for one attempting it with arguably mixed results. But these innovative earbuds actually work consistently and offer the neat ability to be split up to work in tandem. One earbud can be given to a person speaking one language, and the other can be used by someone speaking another language, and the pair can have a cross-language, translated on the fly conversation. Expect Mars-like tech to come to a hearable near you soon. Head-up displays are nothing new, but what is new is the innvoative NUVIZ, an all-in-one motorcycle head-up display (HUD) that delivers an absolute raft of information that enhances each ride. From navigation and speed information through to music playback and control, as well as weather reports, communication and more, the NUVIZ delivers a suite of features that allows users to keep their eyes on the road but be plugged in to various information and entertainment systems at the same time. Naturally, there's also a tidy app, which allows you to customise the system and access rider info. T3 has been following Magic Leap, the super secret tech company valued at $4.5 billion, for years, so we were pretty excited when in mid-2018 its much-wanted AR headset, the Magic Leap One, emerged. The Magic Leap One headset works by letting natural light waves together with softly layered synthetic lightfields enter the wearer's eye, creating augmented reality experiences that are both entertaining and significantly more immersive than pre-existing AR systems. 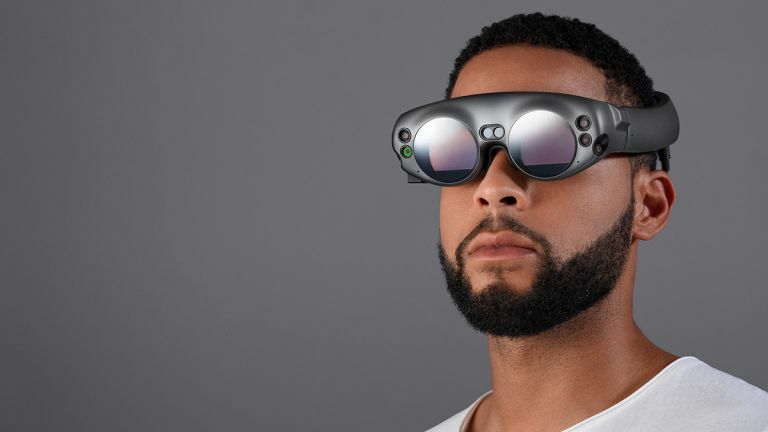 The Magic Leap One on the market right now is designed primarily for developers, and also features an eye-watering price point of $2,295, so we don't expect to see one of these systems in everyone's homes any time soon. However, the technology is impressive and clearly has applications far beyond this initial headset. How many times have you read the criticism that for all the immense power of a top gaming laptop, its size and weight left a lot to be desired? Thick, chunky, and ugly systems have dominated the top end of the best gaming laptop market. Well, that all changed dramatically in 2018, as Nvidia's innovative Max-Q Design tech hit the mainstream gaming laptop market, with systems like the above Asus ROG Zephyrus showcasing exactly why it was so special. That specialness comes from the innovative way Max-Q now allows gaming laptops to be incredibly sleek, thin and quiet, with powerhouse internal hardware like Nvidia's GeForce GTX graphics cards shrunk down to ridiculously small sizes. With Max-Q tech, gaming laptop manufacturers are finally freed to create systems that truly are portable gaming powerhouses. The latest and greatest Apple Watch, which is now on its fourth incarnation, while iterating on its core hardware and OS, also delivered some really innovative new features that look set to be standard in the smartwatch industry going forward. Low and high heart rate notifications help its user stay on top of their health, while a well-engineered fall detection function, which automatically detects if a wearer takes a tumble, and automated Emergency SOS call if the fallen individual does not respond, seem like they could genuinely improve health and save lives. Throw in some equally innovative new functionality like better automatic workout detection, and it is easy to see why the Apple Watch Series 4, for all its familiarity, is actually one of the most innovative gadgets of 2018.